Every time I read another devotional by Amy Carmichael, I say, "Oh, this is my favorite one!" Then when I read the next one and the next one, I say, "Oh, this is my favorite one." One of my favorites is found on pp. 15-17 in I Come Quietly to Meet You: An Intimate Journey in God's Presence. At the beginning of that devotional, Amy talks about how God causes His word, like a strong hand, to reach out and take firm hold of us, leading into a deeper understanding of the truth and a fuller application of it to our lives. As I reflected on that, I remembered a photo I'd taken years ago. It's one of my favorites! It shows my husband having a firm, yet gentle, grasp of our grandson's hand. Michael (age 8) has willingly placed his hand in "Pop's" hand, eager to go wherever Pop wants to take him. Because of the great love they share, Pop would never lead him down harmful paths. Michael knows that. Therefore, he has no fear, no resistance, to being held in the grasp of Pop's hand. Prayer: O Loving Father, may I be even more willing to place my hand in Yours and to eagerly go with You wherever You lead and to obediently do whatever You say. Do you relate to what I’m going through? If so, let me share with you this verse, which I’ve read many times through the years, but which is now “coming alive” and “ringing true” with me. I’ve latched onto its truth like a desert-wanderer gulping life-giving water a fellow traveler shared with him. The verse is in chapter four of the Old Testament book of Zechariah. The wording of the verse (v.10) varies from translation to translation, but the essence of the good news is this: The LORD our God rejoices to see His children begin the work He has called them to do. He doesn’t despise (that is, look down on or belittle) even the smallest efforts we make. If God doesn’t look down on them, then we shouldn't! The verses preceding v. 10 also encourage us. By reading them, we discover that whatever God has called us to do is not to be done in our strength but in His! Whew! What a relief! Those two truths have become the "new tapes" I’m listening to now. To remind me to focus on them, I'm going to put these graphics (included in this post) where I'll see them throughout the day. If you’d like to download them for your personal use or share them on Facebook, etc., please do so! From time to time, I try my hand at writing haiku, a kind of poetry that originated in Japan centuries ago. Although my poems may not be as good as those written by young children, I do enjoy the challenge of telling a story in only three lines of a poem, each of which has a set number of syllables: five in the first line, seven in the second, and five in the third. Recently, as I was choosing "keeper" photos from the hundreds I'd taken on a trip to the beach several months prior, I came across one I'd taken while standing on a 14th floor balcony just after sunrise. I decided to use that photo as inspiration for the poem. I will make that same statement of faith, that same promise. I will rise early and wait patiently...expectantly...for the blessings my God provides. As I wait, I will praise Him and thank Him. What's your strategy for putting a puzzle together? I like to find all the pieces with straight edges and fit them together to form the outer boundary of the puzzle. Then I work on the interior. I group like colors together. I look at the picture on top of the box to see what goes where. If there is any lettering or one part of the picture that stands out, I begin putting that section together. Completing one section motivates me to keep working on the next and the next until I've put the whole thing together. While reflecting on all the time and thinking required to put a puzzle together, I thought, Dealing with life is somewhat like putting a puzzle together! Instead of struggling to put our lives together on our own, wouldn't it be a good idea to do what James 1:5, NKJV, says? A college student encountered many challenges, especially during her senior year. Several of the professors doubted her ability to teach well and to pass the teacher certification tests. They strongly urged her to give up her dream of becoming a teacher, but she refused. She continued to study hard and to do her best, even though getting a good grade required much more effort from her than it did from other students. Despite the long hours she studied at her desk in her dorm room and/or in the library, she remained cheerful and determined to graduate with her class and to pass the teacher certification exams. Thankfully, she didn't give up on her dreams! She went on to become a much-loved, compassionate, and competent teacher. When she died of cancer long before time for her to retire, her students (current and former) and their parents turned out in droves to attend the visitation and the funeral service. Their response meant so much to her dear husband and children and grandchildren because they realized the community also deeply loved and appreciated her. But she might not have had such a well-lived life if she'd listened to those who thought she'd never amount to much! For I know the plans I have for you," says the Eternal [God], "plans for peace, not evil, to give you a future and hope--never forget that. The "woozies" and "wobblies" have slowed me down for over a year. For many days, I've gripped my cane and/or held onto the walls and furniture. Finally, I'm feeling better. Along with the improvement in my balance has come a surge of hope that I just might be able to resume normal activities again--or to become more active than I've been for a long time. Thus, when I opened an email that contained a link to a blog post entitled 71 Ways to Exercise More in 2018, I didn't delete the message, as "hopeless me" might have done before starting to feel better. Do pushups or sit-ups when commercials interrupt your favorite TV shows. Take your dog to the park. Sprint to and from the mailbox. Rather than despair over the ones I can't do right now, I made a list of several I can do, while inside my house. Do calf raises while I brush my teeth. Repeatedly lift and hold both feet off the floor when I'm sitting at my desk and checking e-mails. Doing so will strengthen my core, as well as my leg muscles. While sitting anywhere, point my toes and flex my feet. And I noticed activities I used to do that I can now resume. I know I'll experience good results if I choose to think about what I can do (and do it!) rather than let what I can't do discourage me to the point of doing nothing at all. ..whatever things are true..think on these things. 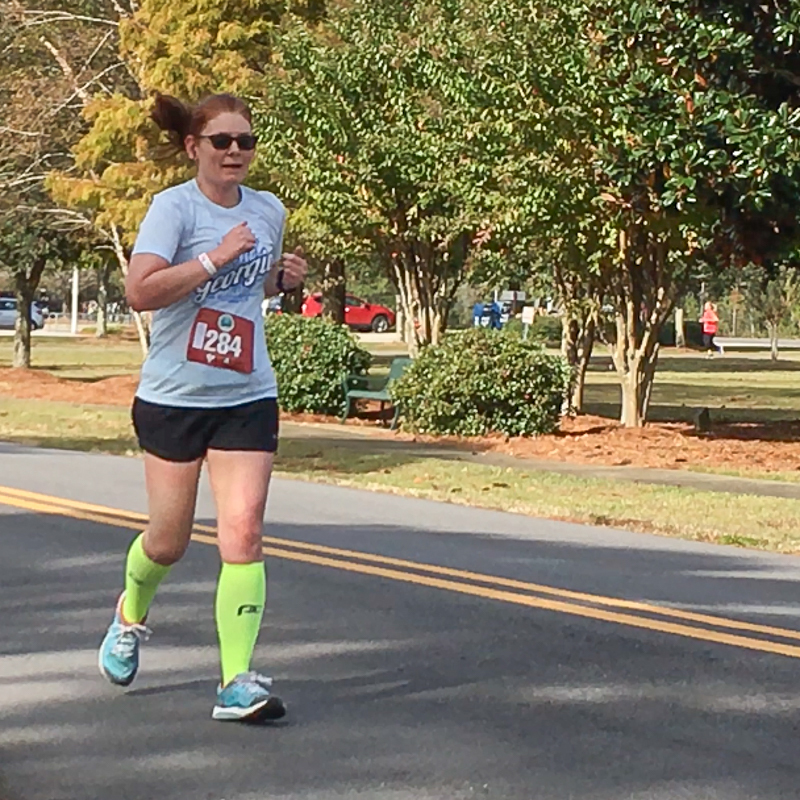 Photo taken during a half-marathon (13 miles) at Orange Beach, AL. My daughter Jena set a goal to run 100 miles each month during 2017--and she exceeded it! Previously, she had not enjoyed running, but now she does. 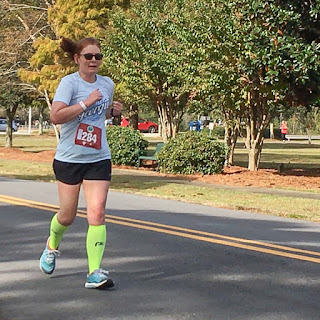 She takes time to run nearly every day; sometimes during her lunch break, sometimes before going to work, sometimes after getting home from work, sometimes in 5Ks and half-marathons, sometimes alone, sometimes with family, sometimes with friends, sometimes in the heat, sometimes in the cold. Running has become a priority for her. Consequently, she's reaching her running goals and experiencing the benefits of a more active lifestyle. Seeing her set goals and work diligently to reach them inspires me to determine my priorities and do them. After all, deciding isn't worth much if there is no follow through. Whatever you do, do [it] well. Ever since I read Mike Ashcroft and Rachel Olsen’s excellent book, My One Word, I’ve chosen one word to focus on each year, as the authors suggest. The first year, I chose the word finish. Throughout each day of that year, I reminded myself to finish whatever could be completed at that time. Rather than flit from task to task, as I tend to do, I’d simply remind myself to finish! I noticed a big change in the amount of work I was able to get done. And I did my work more efficiently and with less stress. The second year, I chose the word love. Many times each day, I’d look for ways to express love to people. Apparently, I did pretty well with that, for a Christmas card my husband and I received that year commended us for the many ways we extend love and care to others. By systematically making one change at a time, followed by another and another, it shouldn't be all that difficult. However, it will demand constant awareness--and constant follow through. And, of course, I'll need to continue to remind myself to finish and to love. Thus says the LORD of hosts: "Consider your ways!"